"Conspiracy theorist"/ truth seeker, Alex Jones, appeared on The View today and defended his friend and fellow 9/11 skeptic, Charlie Sheen. It's not that Mr. Jones chose to focus only on his friendship with Charlie Sheen of all things, but the ladies of The View made sure to limit the scope of discussion so as not to upset their sponsors with "conspiracy talk". At least the millions of The View watchers were introduced to InfoWars. 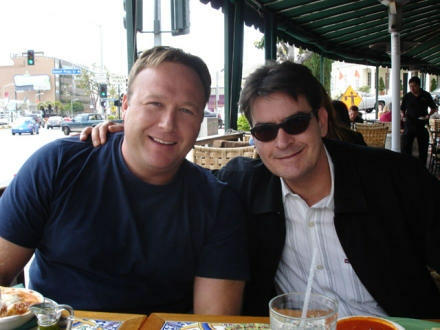 How does Alex Jones know Charlie Sheen anyway? Since appearing on the Alex Jones Show in 2006, Sheen has become a prominent advocate of the 9/11 Truth movement. On September 8, 2009, Sheen appealed to US President Barack Obama to set up a new investigation into the attacks. Sheen asked the President to "initiate a truly independent Congressional investigation into the events of 9/11, as well as its aftermath." Sheen continued: "We want our country back, Mr. President, and therefore I am not just calling on you and your team, I am calling on each and every American citizen to wake up, stand up, and demand the truth." In the last few years, Mr. Sheen has been demonized by the mainstream media for his bouts of drug use and promiscuity. 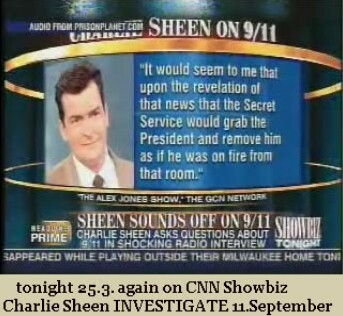 Could the media spotlight on Charlie Sheen be part of a smear campaign to discredit the actor because of Sheen's beliefs regarding the tragedies of 9/11/2001? After making the initial statements regarding his personal view of 9/11 back in 2006, Sheen issued a challenge to debate many mainstream media pundits regarding his stance on 9/11. Although it would surely have made for high ratings, the challenge was ignored. Sheen also challenged mainstream corporate-owned media directly in 2009. After coming forward with his “20 Minutes With The President” letter, Sheen slammed the press for failing to address even one of his 20 bullet points on 9/11 while totally ignoring his challenge to publicly debate 9/11 truth debunkers. Based on Mr. Sheen's past statements regarding 9/11, we at FugginSuggin.com think that there is a possibility that the pipeline of negative attention on Charlie Sheen (since 2006) is part of a media smear campaign to discredit the actor and destroy his reputation in light of his assertions regarding 9/11. He certainly, and without a doubt, has received far more media attention for his drug use, womanizing, and other personal escapades than he has for his statements regarding his stance on 9/11/2001 and the government's investigation on the events of that day.